Staten Island mourns and Erastina refuses to be comforted. Among the fashionable departures for Europe yesterday were Colonel Buffalo Bill, his herd of wild Indians and cowboys, and his company of trained bisons and bronchos. Whether he took the gallant Custer's last charge and the remnants of the United States Seventh Cavalry with him is uncertain, but the burning priaries, the primeval forests, the log cabins and the wigwams were all duly stowed away in the steamer's hold. Only Ugly Face remains to tell the tale. This is America's contribution to the Queen's jubilee. We send these children of nature, with all their dirt and eccentricities of dress and manner, as true samples of our national individuality. The British idea of United States men is founded upon the meek specimens who visit Albion only to imitate her drawl, her slang, her clothes, her sports and her vices. 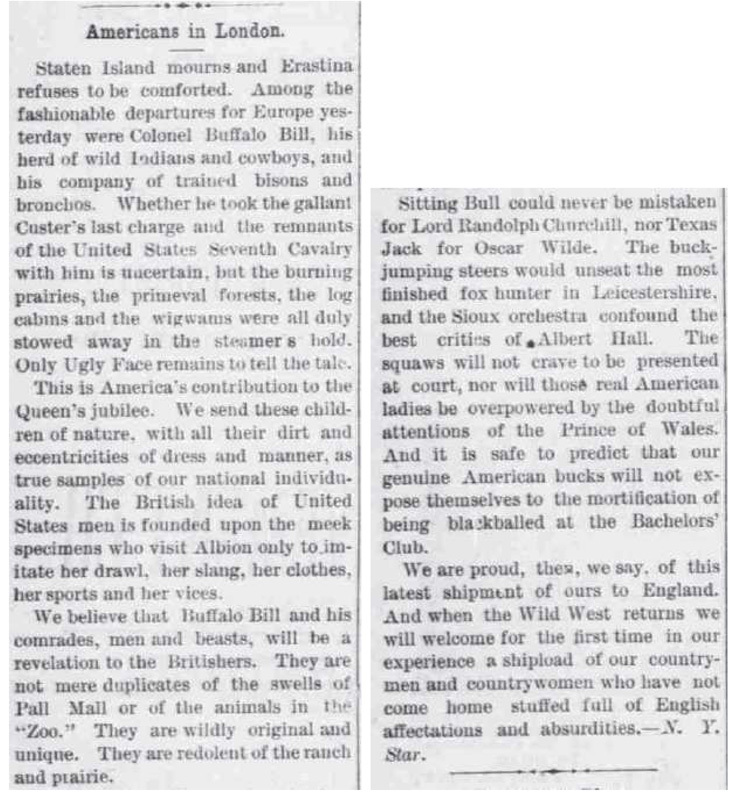 We believe that Buffalo Bill and his comrades, men and beasts, will be a revelation to the Britishers. They are not mere duplicates of the swells of Pall Mall or of the animals in the "Zoo." They are wildly original and unique. They are redolent of the ranch and prairie. Sitting Bull could never be mistaken for Lord Randolph Churchill, nor Texas Jack for Oscar Wilde. 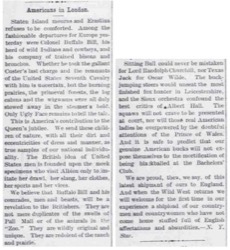 The buck-jumping steers would unseat the most finished fox hunter in Leicestershire, and the Sioux orchestra confound the best critics of Albert Hall. The squaws will not crave to be presented at court, nor will those real American ladies be overpowered by the doubtful attentions of the Prince of Wales. And it is safe to predict that our genuine American bucks will not expose themselves to the mortification of being blackballed at the Bachelors' Club. We are proud, then, we say, of this latest shipment of ours to England. And when the Wild West returns we will welcome for the first time in our experience a shipload of our cuntrymen and countrywomen who have not come home stuffed full of English affectations and absurdities.—N. Y. Star.